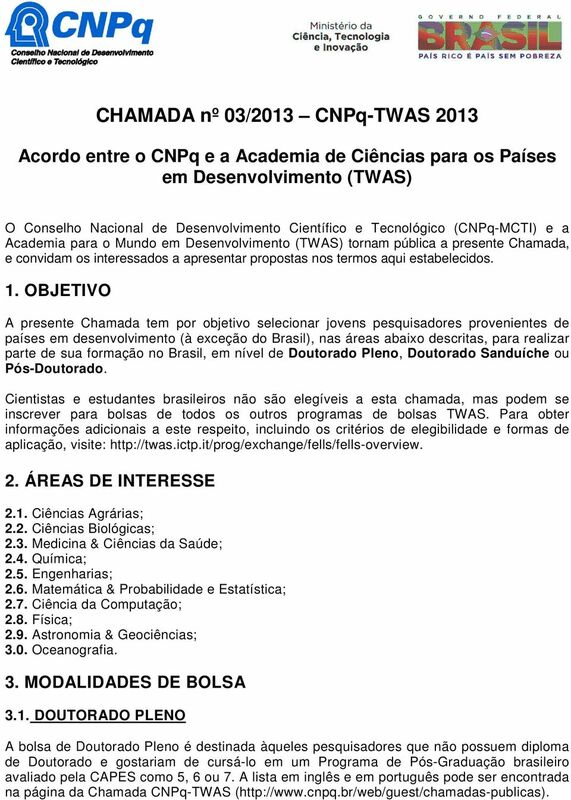 Download "Call for Applications nº 03/2013 CNPq-TWAS 2013"
1 Call for Applications nº 03/2013 CNPq-TWAS 2013 CNPq-TWAS Fellowships Program The Brazilian National Council for Scientific and Technological Development (CNPq-MCTI) and TWAS, the academy of sciences for the developing world, invite interested researchers to apply for this Program. 1. OBJECTIVE This Call for Applications aims to select young researchers from developing countries (except Brazil) to undertake their PhD, Sandwich PhD or Post-Doctoral Research in Brazil in the below mentioned areas of interest. 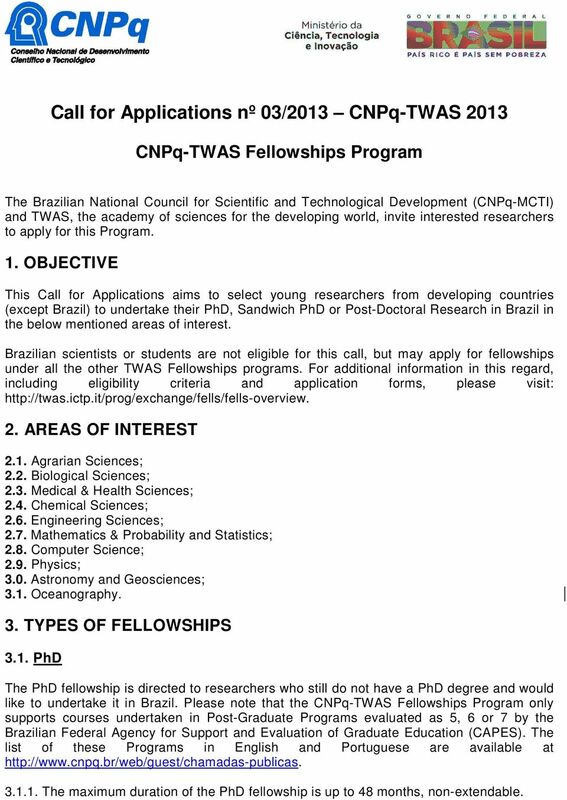 Brazilian scientists or students are not eligible for this call, but may apply for fellowships under all the other TWAS Fellowships programs. For additional information in this regard, including eligibility criteria and application forms, please visit: 2. AREAS OF INTEREST 2.1. Agrarian Sciences; 2.2. Biological Sciences; 2.3. Medical & Health Sciences; 2.4. Chemical Sciences; 2.6. Engineering Sciences; 2.7. Mathematics & Probability and Statistics; 2.8. Computer Science; 2.9. Physics; 3.0. Astronomy and Geosciences; 3.1. Oceanography. 3. TYPES OF FELLOWSHIPS 3.1. PhD The PhD fellowship is directed to researchers who still do not have a PhD degree and would like to undertake it in Brazil. 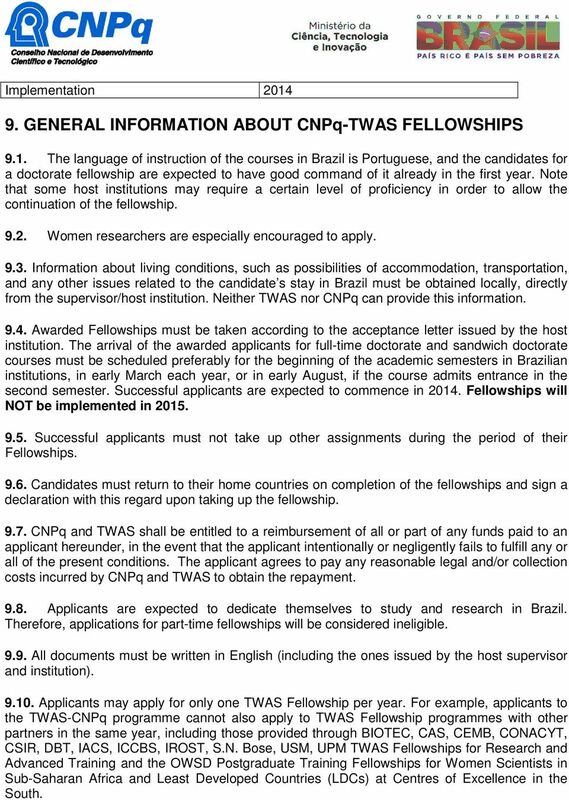 Please note that the CNPq-TWAS Fellowships Program only supports courses undertaken in Post-Graduate Programs evaluated as 5, 6 or 7 by the Brazilian Federal Agency for Support and Evaluation of Graduate Education (CAPES). The list of these Programs in English and Portuguese are available at The maximum duration of the PhD fellowship is up to 48 months, non-extendable. 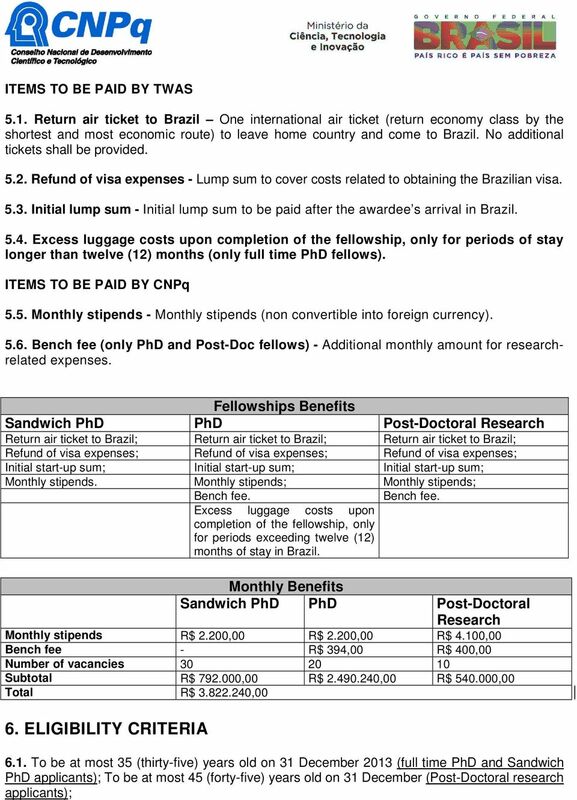 2 If the candidate has previously received stipends from other Brazilian agencies to undertake his/her PhD, these stipends will count to the maximum duration of CNPq-TWAS fellowship SANDWICH PhD The Sandwich PhD is directed to those scholars who would like to have an international experience at a Brazilian Post-Graduate Program during their PhD course. Please note that the CNPq-TWAS Fellowships Program only supports courses undertaken in Post-Graduate Programs evaluated as 5, 6 or 7 by the Brazilian Federal Agency for Support and Evaluation of Graduate Education (CAPES). 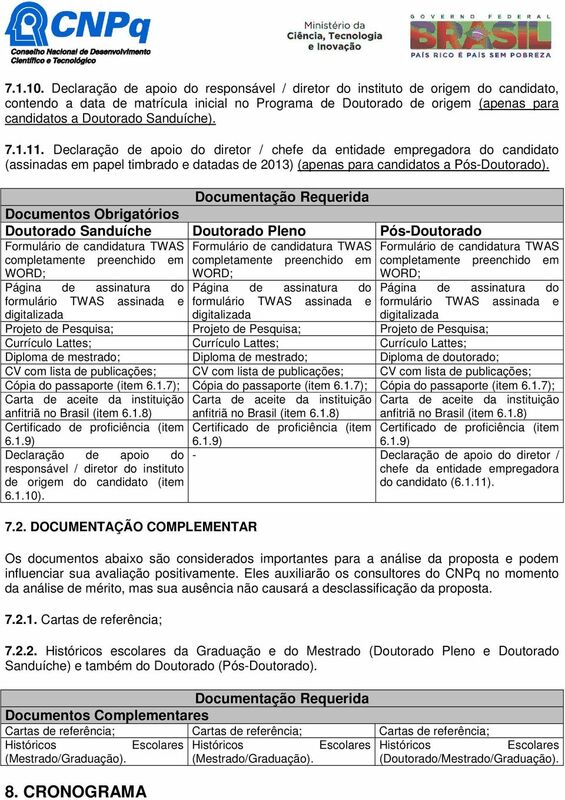 The list of these Programs in English and Portuguese are available at Students who wish to undertake a Sandwich Program must be enrolled in their PhD course for at least one (01) year by the date of the submission The duration of the Sandwich PhD Fellowship is from 6 months up to 12 months POST-DOCTORAL RESEARCH The Post-Doctoral Research Fellowship is directed to those established and employed researchers who wish to do Post-Doctoral research at a Brazilian Post-Graduate Program evaluated as 5, 6 or 7 by the Brazilian Federal Agency for Support and Evaluation of Graduate Education (CAPES). The list of these Programs in English and Portuguese are available at The duration of the Post Doc Fellowship is from 6 months up to 12 months. 4. VACANCIES 4.1. 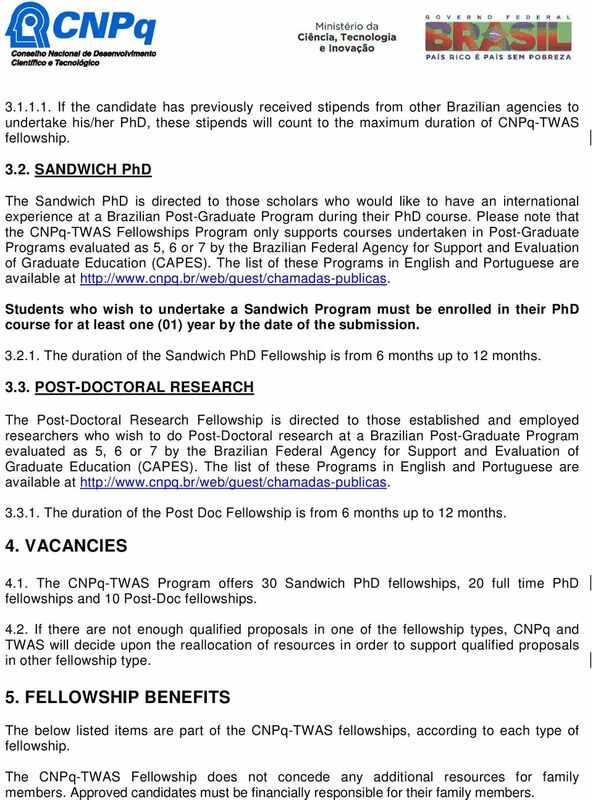 The CNPq-TWAS Program offers 30 Sandwich PhD fellowships, 20 full time PhD fellowships and 10 Post-Doc fellowships If there are not enough qualified proposals in one of the fellowship types, CNPq and TWAS will decide upon the reallocation of resources in order to support qualified proposals in other fellowship type. 5. FELLOWSHIP BENEFITS The below listed items are part of the CNPq-TWAS fellowships, according to each type of fellowship. The CNPq-TWAS Fellowship does not concede any additional resources for family members. Approved candidates must be financially responsible for their family members. 5 Lattes Curriculum, the CNPq standard online Curriculum Vitae available at filled out and submitted before the submission through the online application form; Degree certificate (Master s for full time PhD and Sandwich PhD applicants / PhD s for Post-Doctoral applicants); Curriculum Vitae, including a list of publications; Copy of the passport showing personal and validity details; Official letter of acceptance signed by the head of the host department Candidates must choose courses evaluated as 5, 6 or 7 by the Brazilian Federal Agency for Support and Evaluation of Graduate Education (CAPES). The list of these Programs can be found here ( The acceptance letter must state 2014 as the year of the beginning of activities and must be signed by the coordinator of the Post-Graduate program. Acceptance letters signed only by the supervisor WILL NOT BE ACCEPTED and the application will be disqualified The acceptance letter must also state the name of the Brazilian supervisor and the course duration in months (36, 48 or as defined by the university). 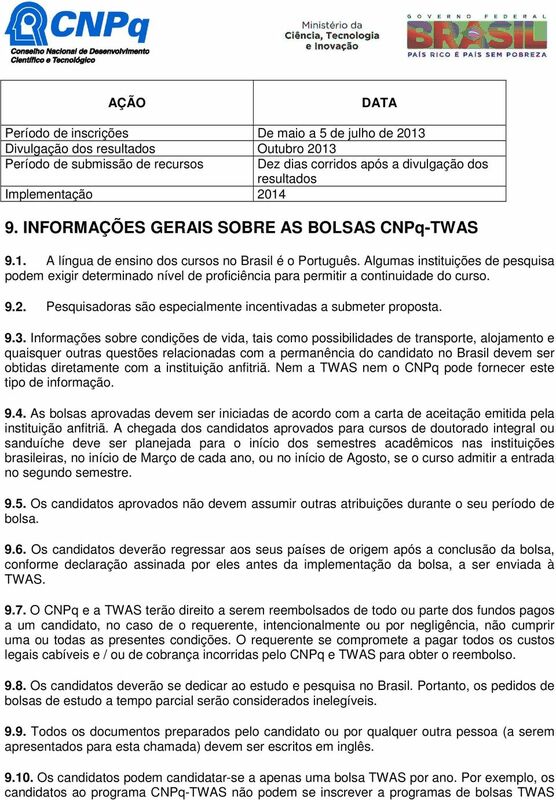 CNPq and TWAS will consider this duration in order to concede the fellowship, so applicants are encouraged to verify this question Candidates accepted by private institutions will only be considered eligible if the acceptance letter states the student will be EXEMPT FROM THE PAYMENT OF ALL FEES, which will not be covered by CNPq and TWAS under any circumstances. 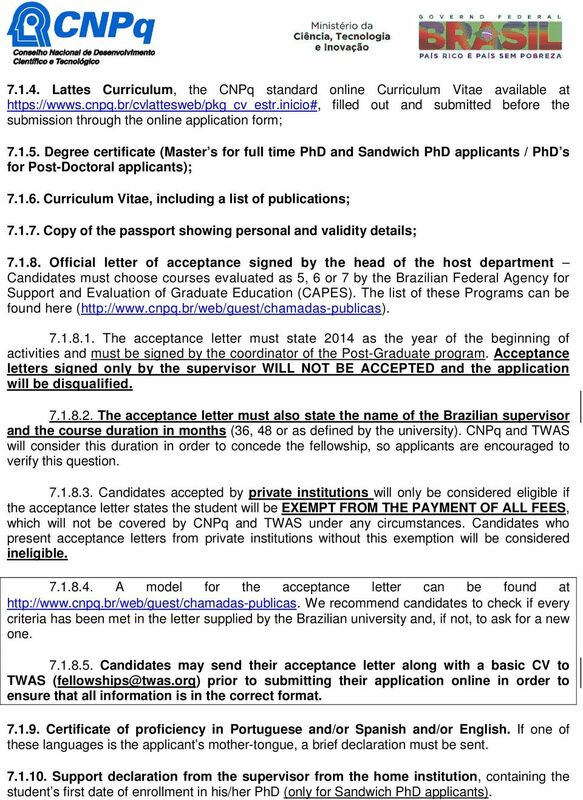 Candidates who present acceptance letters from private institutions without this exemption will be considered ineligible A model for the acceptance letter can be found at We recommend candidates to check if every criteria has been met in the letter supplied by the Brazilian university and, if not, to ask for a new one Candidates may send their acceptance letter along with a basic CV to TWAS prior to submitting their application online in order to ensure that all information is in the correct format Certificate of proficiency in Portuguese and/or Spanish and/or English. 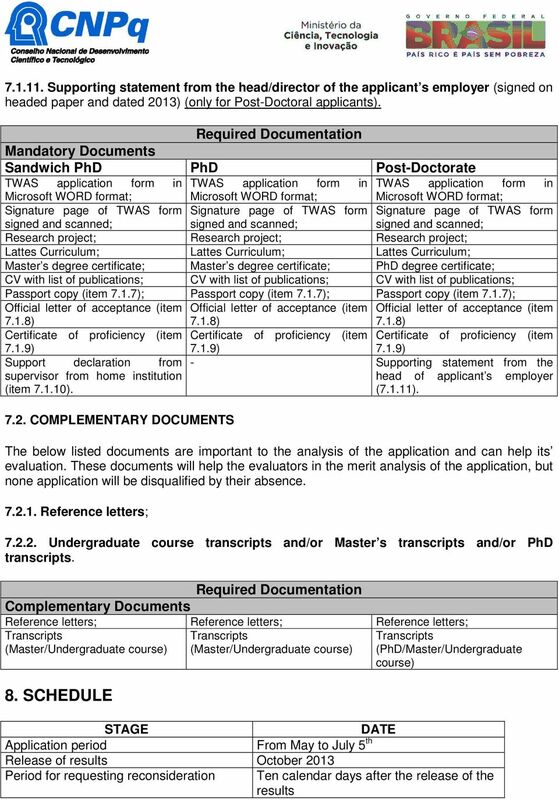 If one of these languages is the applicant s mother-tongue, a brief declaration must be sent Support declaration from the supervisor from the home institution, containing the student s first date of enrollment in his/her PhD (only for Sandwich PhD applicants). 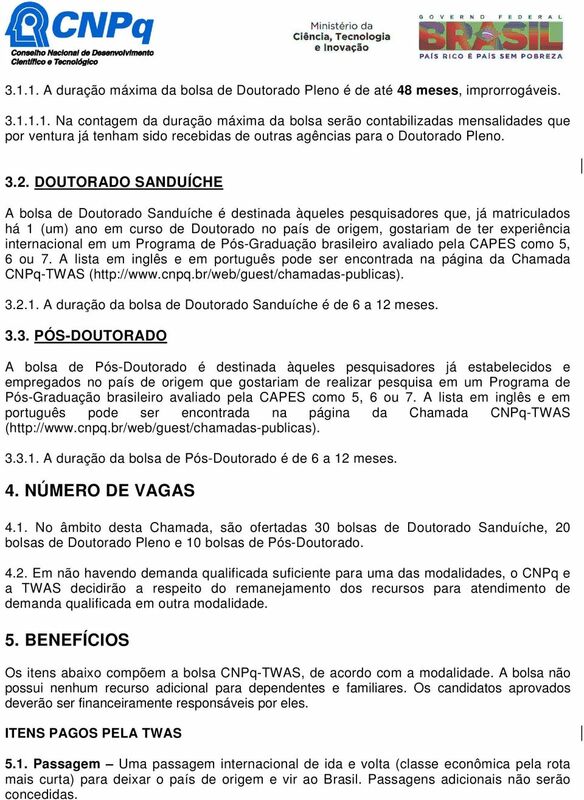 7 Implementation GENERAL INFORMATION ABOUT CNPq-TWAS FELLOWSHIPS 9.1. The language of instruction of the courses in Brazil is Portuguese, and the candidates for a doctorate fellowship are expected to have good command of it already in the first year. 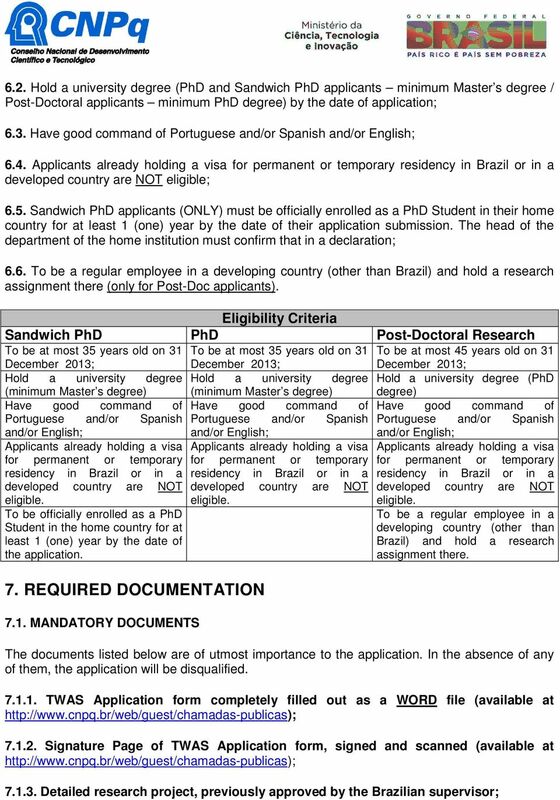 Note that some host institutions may require a certain level of proficiency in order to allow the continuation of the fellowship Women researchers are especially encouraged to apply Information about living conditions, such as possibilities of accommodation, transportation, and any other issues related to the candidate s stay in Brazil must be obtained locally, directly from the supervisor/host institution. Neither TWAS nor CNPq can provide this information Awarded Fellowships must be taken according to the acceptance letter issued by the host institution. 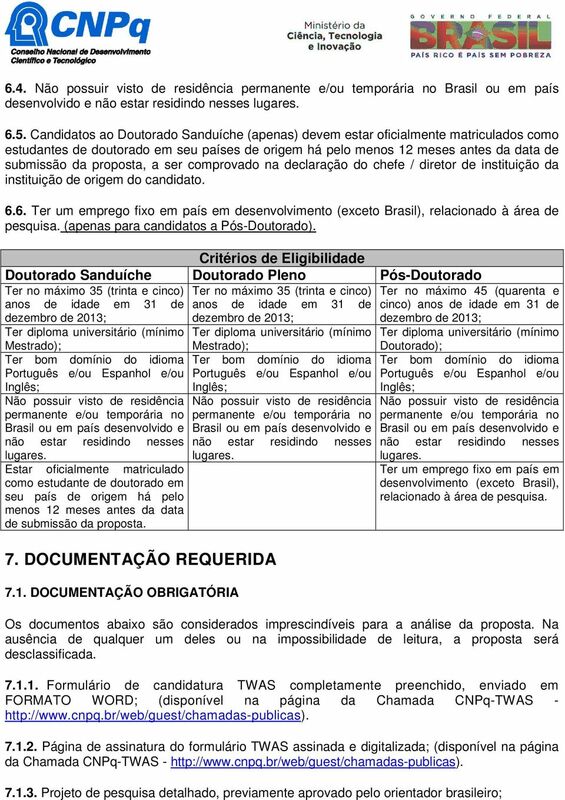 The arrival of the awarded applicants for full-time doctorate and sandwich doctorate courses must be scheduled preferably for the beginning of the academic semesters in Brazilian institutions, in early March each year, or in early August, if the course admits entrance in the second semester. Successful applicants are expected to commence in Fellowships will NOT be implemented in Successful applicants must not take up other assignments during the period of their Fellowships Candidates must return to their home countries on completion of the fellowships and sign a declaration with this regard upon taking up the fellowship CNPq and TWAS shall be entitled to a reimbursement of all or part of any funds paid to an applicant hereunder, in the event that the applicant intentionally or negligently fails to fulfill any or all of the present conditions. The applicant agrees to pay any reasonable legal and/or collection costs incurred by CNPq and TWAS to obtain the repayment Applicants are expected to dedicate themselves to study and research in Brazil. Therefore, applications for part-time fellowships will be considered ineligible All documents must be written in English (including the ones issued by the host supervisor and institution) Applicants may apply for only one TWAS Fellowship per year. For example, applicants to the TWAS-CNPq programme cannot also apply to TWAS Fellowship programmes with other partners in the same year, including those provided through BIOTEC, CAS, CEMB, CONACYT, CSIR, DBT, IACS, ICCBS, IROST, S.N. Bose, USM, UPM TWAS Fellowships for Research and Advanced Training and the OWSD Postgraduate Training Fellowships for Women Scientists in Sub-Saharan Africa and Least Developed Countries (LDCs) at Centres of Excellence in the South. 8 10. APPLICATION PROCESS Proposals must contain all necessary documents and must be sent to CNPq exclusively via Internet, through the online application form (Plataforma Carlos Chagas). Guidelines to the online form submission can be found at ( The fulfilling of a Lattes Curriculum previous to the submission is indispensable to the application process. After registering a CV Lattes, you will have access to the online application form at Plataforma Carlos Chagas. Please access where you can register your Lattes (an English version of the form is available in the page s top right corner). Candidates will not be able to submit applications without a CV Lattes. 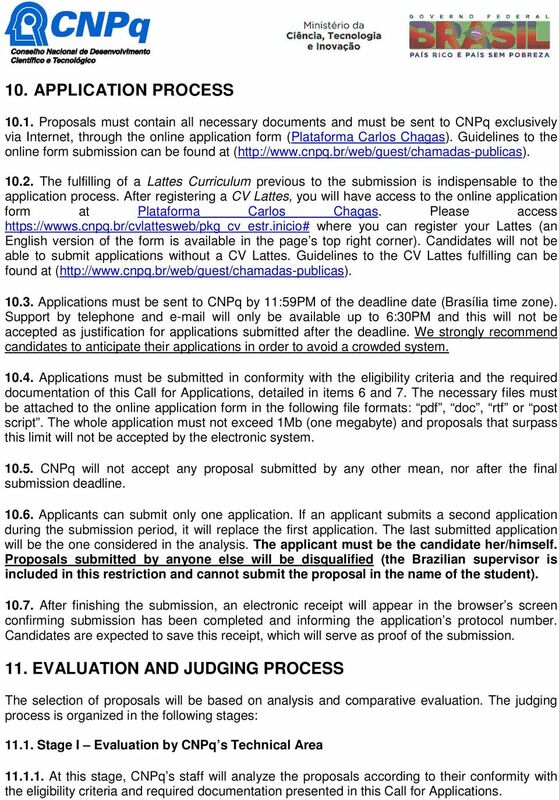 Guidelines to the CV Lattes fulfilling can be found at ( Applications must be sent to CNPq by 11:59PM of the deadline date (Brasília time zone). Support by telephone and will only be available up to 6:30PM and this will not be accepted as justification for applications submitted after the deadline. We strongly recommend candidates to anticipate their applications in order to avoid a crowded system Applications must be submitted in conformity with the eligibility criteria and the required documentation of this Call for Applications, detailed in items 6 and 7. The necessary files must be attached to the online application form in the following file formats: pdf, doc, rtf or post script. The whole application must not exceed 1Mb (one megabyte) and proposals that surpass this limit will not be accepted by the electronic system CNPq will not accept any proposal submitted by any other mean, nor after the final submission deadline Applicants can submit only one application. If an applicant submits a second application during the submission period, it will replace the first application. The last submitted application will be the one considered in the analysis. The applicant must be the candidate her/himself. 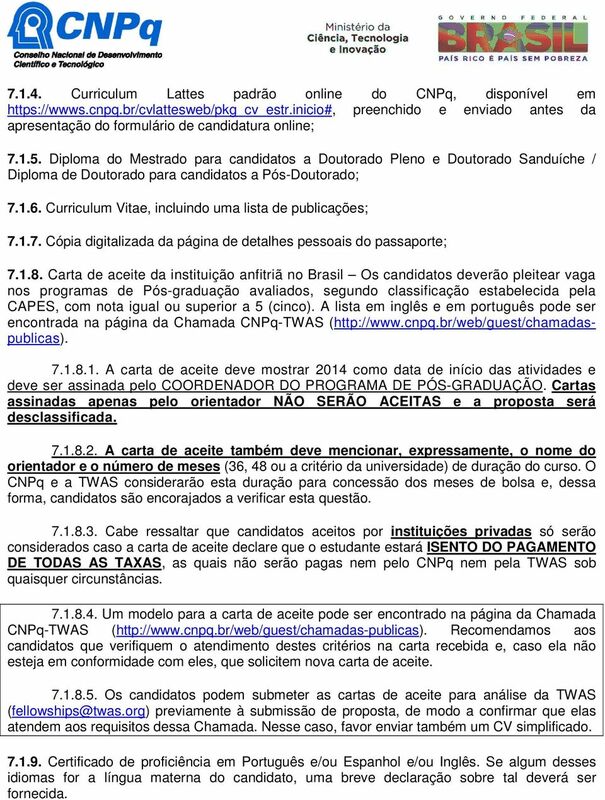 Proposals submitted by anyone else will be disqualified (the Brazilian supervisor is included in this restriction and cannot submit the proposal in the name of the student) After finishing the submission, an electronic receipt will appear in the browser s screen confirming submission has been completed and informing the application s protocol number. Candidates are expected to save this receipt, which will serve as proof of the submission. 11. EVALUATION AND JUDGING PROCESS The selection of proposals will be based on analysis and comparative evaluation. The judging process is organized in the following stages: Stage I Evaluation by CNPq s Technical Area At this stage, CNPq s staff will analyze the proposals according to their conformity with the eligibility criteria and required documentation presented in this Call for Applications. 9 11.2. Stage II Evaluation by ad hoc consultants At this stage, the proposals will be sent to renowned Brazilian professors registered in CNPq s system who will analyze the merit and relevance of qualified proposals Stage III Evaluation, Judging and Classification by the Judging Committee Proposals will be evaluated and classified by renowned Brazilian professors, who will meet at CNPq s head office. 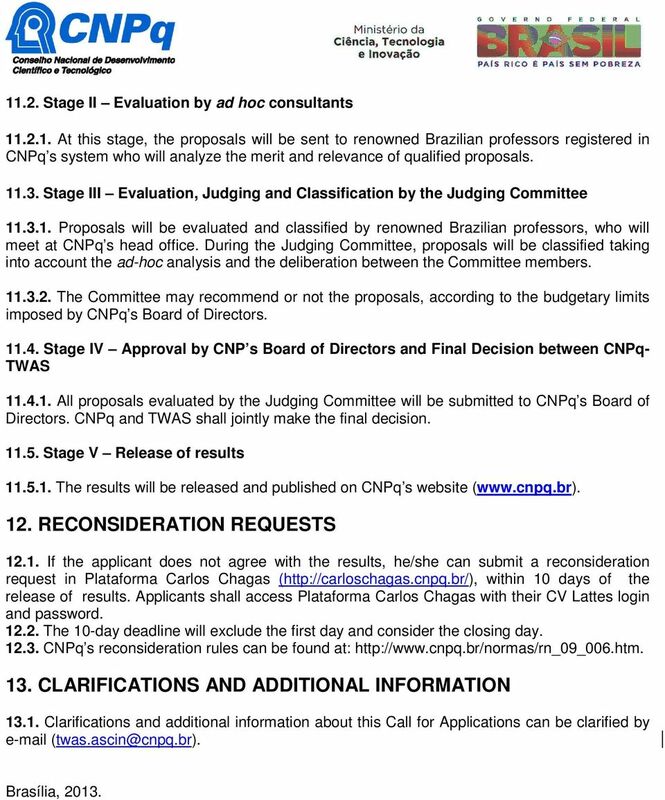 During the Judging Committee, proposals will be classified taking into account the ad-hoc analysis and the deliberation between the Committee members The Committee may recommend or not the proposals, according to the budgetary limits imposed by CNPq s Board of Directors Stage IV Approval by CNP s Board of Directors and Final Decision between CNPq- TWAS All proposals evaluated by the Judging Committee will be submitted to CNPq s Board of Directors. CNPq and TWAS shall jointly make the final decision Stage V Release of results The results will be released and published on CNPq s website ( 12. RECONSIDERATION REQUESTS If the applicant does not agree with the results, he/she can submit a reconsideration request in Plataforma Carlos Chagas ( within 10 days of the release of results. Applicants shall access Plataforma Carlos Chagas with their CV Lattes login and password The 10-day deadline will exclude the first day and consider the closing day CNPq s reconsideration rules can be found at: CLARIFICATIONS AND ADDITIONAL INFORMATION Clarifications and additional information about this Call for Applications can be clarified by Brasília, 2013. 11 A duração máxima da bolsa de Doutorado Pleno é de até 48 meses, improrrogáveis Na contagem da duração máxima da bolsa serão contabilizadas mensalidades que por ventura já tenham sido recebidas de outras agências para o Doutorado Pleno DOUTORADO SANDUÍCHE A bolsa de Doutorado Sanduíche é destinada àqueles pesquisadores que, já matriculados há 1 (um) ano em curso de Doutorado no país de origem, gostariam de ter experiência internacional em um Programa de Pós-Graduação brasileiro avaliado pela CAPES como 5, 6 ou 7. A lista em inglês e em português pode ser encontrada na página da Chamada CNPq-TWAS ( A duração da bolsa de Doutorado Sanduíche é de 6 a 12 meses PÓS-DOUTORADO A bolsa de Pós-Doutorado é destinada àqueles pesquisadores já estabelecidos e empregados no país de origem que gostariam de realizar pesquisa em um Programa de Pós-Graduação brasileiro avaliado pela CAPES como 5, 6 ou 7. A lista em inglês e em português pode ser encontrada na página da Chamada CNPq-TWAS ( A duração da bolsa de Pós-Doutorado é de 6 a 12 meses. 4. NÚMERO DE VAGAS 4.1. 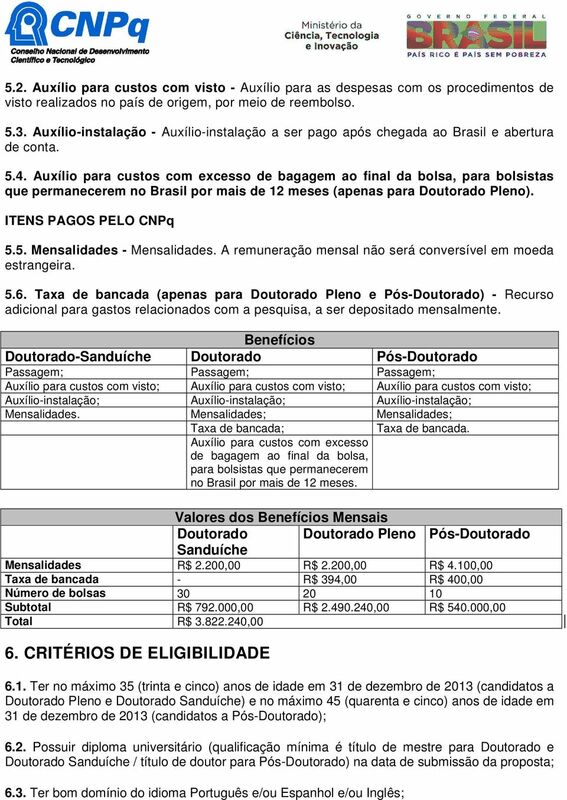 No âmbito desta Chamada, são ofertadas 30 bolsas de Doutorado Sanduíche, 20 bolsas de Doutorado Pleno e 10 bolsas de Pós-Doutorado Em não havendo demanda qualificada suficiente para uma das modalidades, o CNPq e a TWAS decidirão a respeito do remanejamento dos recursos para atendimento de demanda qualificada em outra modalidade. 5. BENEFÍCIOS Os itens abaixo compõem a bolsa CNPq-TWAS, de acordo com a modalidade. A bolsa não possui nenhum recurso adicional para dependentes e familiares. Os candidatos aprovados deverão ser financeiramente responsáveis por eles. ITENS PAGOS PELA TWAS 5.1. Passagem Uma passagem internacional de ida e volta (classe econômica pela rota mais curta) para deixar o país de origem e vir ao Brasil. Passagens adicionais não serão concedidas. 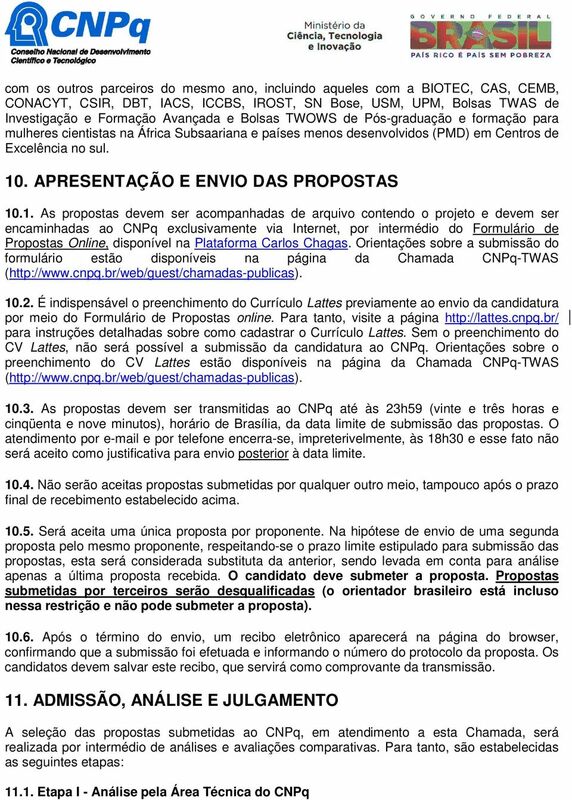 14 Curriculum Lattes padrão online do CNPq, disponível em preenchido e enviado antes da apresentação do formulário de candidatura online; Diploma do Mestrado para candidatos a Doutorado Pleno e Doutorado Sanduíche / Diploma de Doutorado para candidatos a Pós-Doutorado; Curriculum Vitae, incluindo uma lista de publicações; Cópia digitalizada da página de detalhes pessoais do passaporte; Carta de aceite da instituição anfitriã no Brasil Os candidatos deverão pleitear vaga nos programas de Pós-graduação avaliados, segundo classificação estabelecida pela CAPES, com nota igual ou superior a 5 (cinco). A lista em inglês e em português pode ser encontrada na página da Chamada CNPq-TWAS ( A carta de aceite deve mostrar 2014 como data de início das atividades e deve ser assinada pelo COORDENADOR DO PROGRAMA DE PÓS-GRADUAÇÃO. Cartas assinadas apenas pelo orientador NÃO SERÃO ACEITAS e a proposta será desclassificada A carta de aceite também deve mencionar, expressamente, o nome do orientador e o número de meses (36, 48 ou a critério da universidade) de duração do curso. 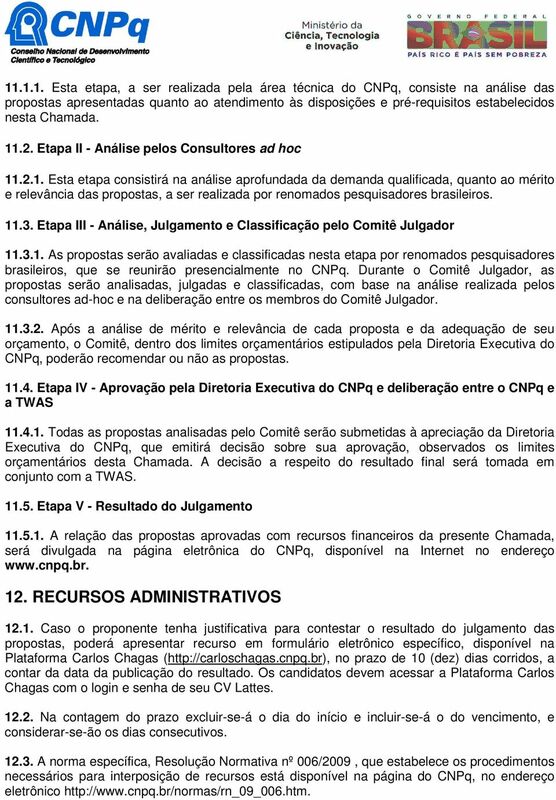 O CNPq e a TWAS considerarão esta duração para concessão dos meses de bolsa e, dessa forma, candidatos são encorajados a verificar esta questão Cabe ressaltar que candidatos aceitos por instituições privadas só serão considerados caso a carta de aceite declare que o estudante estará ISENTO DO PAGAMENTO DE TODAS AS TAXAS, as quais não serão pagas nem pelo CNPq nem pela TWAS sob quaisquer circunstâncias Um modelo para a carta de aceite pode ser encontrado na página da Chamada CNPq-TWAS ( Recomendamos aos candidatos que verifiquem o atendimento destes critérios na carta recebida e, caso ela não esteja em conformidade com eles, que solicitem nova carta de aceite Os candidatos podem submeter as cartas de aceite para análise da TWAS previamente à submissão de proposta, de modo a confirmar que elas atendem aos requisitos dessa Chamada. Nesse caso, favor enviar também um CV simplificado Certificado de proficiência em Português e/ou Espanhol e/ou Inglês. Se algum desses idiomas for a língua materna do candidato, uma breve declaração sobre tal deverá ser fornecida. 19 13. ESCLARECIMENTOS E INFORMAÇÕES ADICIONAIS Esclarecimentos e informações adicionais acerca do conteúdo desta Chamada podem ser obtidos por Brasília, 2013.